Home » Press & News » Press Releases » hoichoi Original ‘HELLO’ is back with a bang! hoichoi Original ‘HELLO’ is back with a bang! The official Trailer of Hello Season 2 is here! 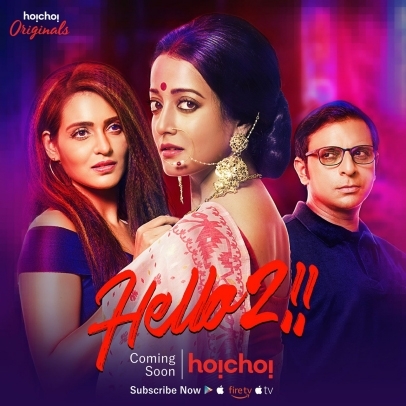 Kolkata, November 24, 2018: hoichoi began its journey on 20th September 2017 with its first Original Web Series titled – Hello starring eminent actors Raima Sen, Priyanka Sarkar and Joy Sengupta. The show became an instant hit with audience giving raving reviews. Thus, began the string of numerous requests flowing in for Season 2.
hoichoi on their first anniversary this year, announced 30 Original Shows and 12 Original Films for 2018-2019 which included the most-anticipated Season 2 of all shows – Hello. In a lavish press conference today, the trailer was launched in front of media and in the presence of lead cast – Raima Sen, Priyanka Sarkar and director, Soumik Chattopadhyay. The official trailer starts off from where the first season ended, Anonyo (Joy Sengupta) is at the doorstep of his girlfriend Nina (Priyanka Sarkar), ramming hard on the door and demanding her to let his wife Nandita (Raima Sen) out. Once the door opens, the drama begins with judgements flooding round and about as he accuses both of having a lesbian relationship behind his back. Disappointment and betrayal or love and trust will win the war of this complicated web of relationship, which these three have entangled themselves into? The official teaser of Hello, which was released a week earlier was trending No. 1 on YouTube for 24 hours straight! Hello, a hoichoi Original, directed by Soumik Chattopadhyay will stream from this December. hoichoi is the world’s largest digital content platform exclusively for Bengalis. It showcases the best in Bengali entertainment content with new exclusive Original web series, films, shorts films every month and 500+ acquired movies. Recently, an audio-streaming feature was added which has a library of 1000+ Bengali songs for free. 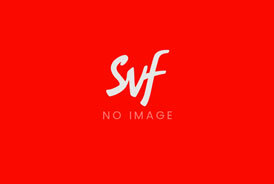 Founded in 2017, it is SVF New Media’s maiden venture. Hoichoi is headed by Co-Founder Vishnu Mohta who is also the Executive Director, SVF. Apart from a vast Content Library, AD free Seamless Viewing Experience with unlimited HD video streaming and Multi-Device Capability are important features of Hoichoi. It is available for download on Android and iOS and supports viewing across all popular platforms – Mobiles, PCs, Laptops and Tablets. It is also Chromecast and AirPlay enabled and available on Apple TV, Amazon Fire TV and will be coming soon on Roku TV. Bornoporichoy – A Grammar of Death! © 2019 SVF Entertainment Private Limited. All rights reserved.